This week we’re joined by the crew from the I Don’t Give an F-Stop Podcast to talk about wedding photography, running small businesses, a little bit about their podcast and a lot about their relationships with each other. We talk a lot about styled shoots, the back end of producing a live video show that’s then turned into a podcast, working for Disney, what kind of man meat could make a girl break up with her boyfriend of 2 years at first sight, and some scary stuff like dealing with life threatening illnesses. How long do you have to wait after one of your couples divorces before you slide into their DMs? What sort of client gifts are appropriate to give to your clients? What do you do to get something back from a client who stole it? Check out their Facebook page and Facebook group. 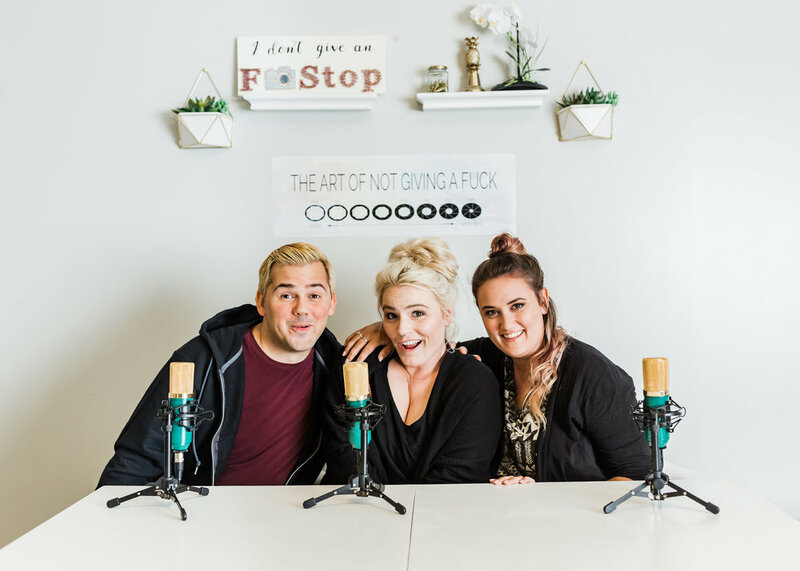 Subscribe to I Don't Give An F-Stop on iTunes or Spreaker. You can find Megan on her website and on Instagram. You can find Sarah on her website and on Instagram. You can find Carey on Plenty of Fish... as soon as we finish making his account. Username will be CareyIsDTF. Love the podcast? You can support us on Anchor for as little as $.99 a month! Edited by Bespoke Tone. Go to bespoketone.com for all your photo, video, and audio editing needs. Subscribe in iTunes, Overcast, Spotify, Google Play, Google Podcasts, or Stitcher.needs.